Absolutely Delicious! Fresh Almonds and Pecans covered in a glaze of sugar, vanilla and cinnamon roasted to perfection....ahhhh, the aroma is sensational! Bagged in perfect little snack totes, just right for these light, sweet and crunchy nuts. 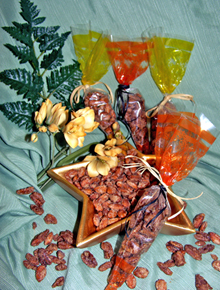 Treat yourself or let your family, friends, clients & business associates know you are Nuts About Them! Choose Almonds or Pecans.